This post has been updated to include information from the Pentagon and Navy’s press briefings on the Fiscal Year 2018 budget. THE PENTAGON — 2018 may be the Navy’s opportunity to dig out of a massive readiness hole found in its aviation enterprise and at the public shipyards, with the Pentagon’s budget request focusing on maintenance and readiness spending. Though acquisition spending is down compared to last year, the service is requesting $51.3 billion for its operations and maintenance budget, compared to $48.2 billion in 2017 and $46.9 billion in 2016. That 6.5 percent increase includes $2.5 billion more for air operations and $4 billion more for ship operations. On the ship side, the Navy is looking to increase is public shipyard workforce from 33,850 full-time equivalent workers to 34,988, or a 3.4 percent increase, “to increase shipyard throughput,” the Navy’s budget highlights book notes. 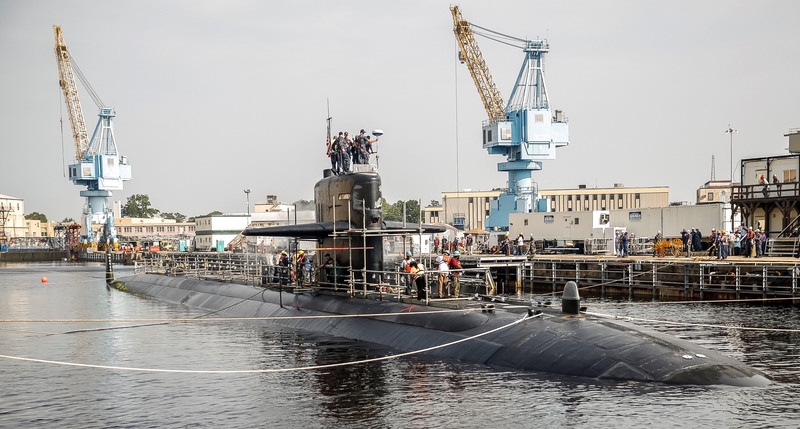 “Additionally, to help reduce [naval shipyard] workload and better align workload to capacity, FY 2018 funds planning for private sector submarine maintenance to reduce the impact to follow-on maintenance work. These efforts minimize the more expensive future execution of deferred maintenance work, maximize utilization of private and public maintenance capacity, and support [the Navy’s Optimized Fleet Response Plan],” the book reads, referring to persistent backlogs of work at the public yards that have left multiple attack submarines unable to get into the yards for work. This increase in shipyard personnel and assistance from the private sector will contribute to the Navy being able to conduct 71 ship maintenance availabilities, or 10 more than last year, Deputy Assistant Secretary of the Navy for Budget Rear Adm. Brian Luther told reporters during a budget rollout briefing today. Those availabilities will help chip away at the $3.5 billion in deferred maintenance the Navy faces, he added. Ship maintenance is funded at 100 percent of required levels through both base budget and Overseas Contingency Operations funding, for a total of $11.8 billion. On aviation, the Navy and Marine Corps looked to address support accounts that contribute to ongoing readiness challenges – spare parts, logistics and other flight line readiness enablers. “FY 2018 funding supports the maximum executable requirements of deployed units, units training in preparation to deploy, and of non-deployed units for sustainment and maintenance readiness levels,” according to the Navy budget highlights book. Commandant of the Marine Corps Gen. Robert B. Neller and Chief of Naval Operations Adm. John Richardson visit the Fleet Readiness Center Southwest (FRCSW) at Naval Air Station North Island, Calif., Feb. 19, 2016. 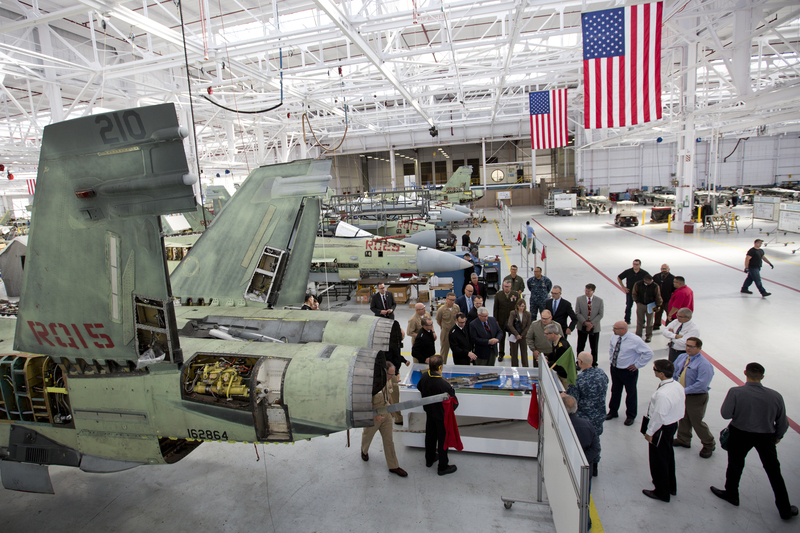 Neller toured the depot to observe the FA-18 maintenance repair process. US Marine Corps photo. Despite those limitations, “aviation spares is funded to the highest level in the last 14 years, at 91 percent,” Luther said. As a result, Defense Secretary James Mattis created a “preferred weapon” status within the FY 2018 budget request, John Roth, acting as the Pentagon comptroller, told reporters today. “As we closed out this budget over the last two or three weeks in particular, a great deal of concern was being raised with current inventory levels and, particularly given some of the [weapons] expenditures in the CENTCOM area of operations as we talk, and so the secretary mandated and insisted that we fully fund to the maximum extent possible the full production capability for certain selected preferred munitions – things like the Hellfire, things like the JDAM and the Guided Multiple Launch Rocket System,” Roth said. Preferred weapons include the Hellfire air-to-surface missile, Tomahawk Land Attack Missile, small-diameter bomb, Advanced Precision-Kill Weapon System, Guided Multiple Launch Rocket System and Joint Direct Attack Munition. Though still taking risk in shore infrastructure to help pay for operational fleet readiness, the Navy and Marine Corps are making some major investments in military construction that directly help the readiness rebuilding effort. These MILCON projects – $73 million for the Ship Repair Training Facility at Naval Support Activity Norfolk; $62 million to improve the Paint, Blast and Rubber Facility at Portsmouth Naval Shipyard; $61 million for an F/A-18 Avionics Repair Facility replacement at Naval Air Station Lemoore; and more – pushed the services to a 13-percent higher “major construction” budget request than last year, and 11.6 percent higher MILCON budget overall. Despite the emphasis on restoring readiness – with 100 percent of the ship readiness requirement being funded and about 90 percent of the aviation readiness requirement being funded, which are higher than historical averages, the Marine Corps is only funding its ground equipment depot maintenance at 79 percent of the requirement.